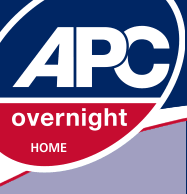 APC Overnight – The Alternative Parcels Company Ltd. – Courier delivery company based in Wolverhampton with more than 125 depots around the U.K making us one of the biggest next day delivery networks in the United Kingdom. Saturday courier deliveries. Owned and run by independent local delivery specialists. Delivering throughout Britain, Ireland and partnered with Geodis Calberson for European courier parcel deliveries. International delivery to such places like the U.S.A and as far as Australia and more. Find out more at our website or call number below. Find your local U.K Depot.